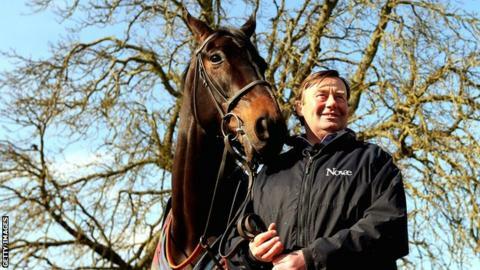 Trainer Nicky Henderson believes he has his best chance yet of winning the Grand National. Henderson, who has been British jump racing champion trainer three times, has four runners in Saturday's race. Long Run, Hunt Ball, Triolo D'Alene and Shakalakaboomboom have all been entered at Aintree for the sport's most famous race. "It's probably more realistic than it's been before," 63-year-old Henderson told BBC South Today. "We've had several shots at it and been close. It's the one that's missing. We've been close enough a few times, so it would be nice to win before it's all over." Lambourn-based Henderson admitted he had not originally intended to enter all four horses for the four-mile, three-and-a-half-furlong race, run over 30 fences. "At the beginning of the season, you either know if you've got a National horse or you haven't. Funnily enough, the last few years, I could have told you before Christmas we hadn't got one," he said. "This year, I was fairly confident there were two. Triolo D'Alene and Shakalakaboomboom were on the line. Hunt Ball, I didn't know about because he's only just come to us and Long Run, we had a change of plan around Christmas time. "I haven't gone out to pick four because we haven't won the National before. This year, we genuinely have four National horses. They have to be the right animals for it because it is a specialist race and they have to be suitable." During his training career, Henderson has won most of National Hunt's biggest races including the Cheltenham Gold Cup, Champion Hurdle, King George VI Chase and Hennessy Gold Cup. "The Grand National is completely different as you are asking the horse a different question," he said. "First and foremost, I want them all home safe and sound. They have modified it (the course) quite considerably and it is very different race and much safer, but one is always aware of the difficulty of it and that is why one has to pick the right horse." Long Run, the 2011 Cheltenham Gold Cup winner, offers the best chance, according to the pre-race odds, and won last time out at Kelso, ridden by Sam Waley-Cohen. "With Long Run, at Christmas we decided we would take the Grand National route, rather the Gold Cup route. The Gold Cup turned out to be quite a rather odd race, so I kind of regret we didn't run Long Run in it because of the way it finished," added Henderson. "We decided to keep him cherry ripe for this. He ran well at Kelso, he's schooled very well, he's had a practice over Aintree type obstacles and he's been very good."